The leading authority on Japanese art history tells the story of how the country has nurtured unique aesthetics, prominent artists, and distinctive movements. Nobuo Tsuji sheds light on works ranging from the Jōmon period to contemporary art, from earthenware figurines in 13,000 B.C. to manga and modern subcultures. 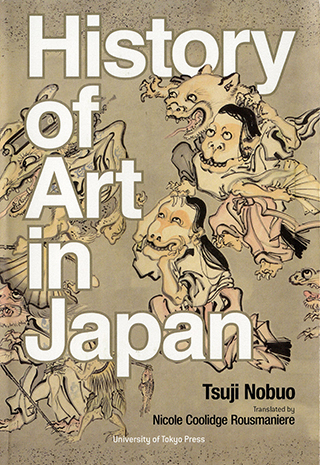 Tsuji Nobuo’s masterful History of Art in Japan is a unique, fully-illustrated overview of Japanese art in a single volume, written by one of Japan’s most distinguished art historians. It covers the entire history of Japanese art from prehistoric Jōmon flame pots to twenty-first-century digital media. It is comprehensive, too, in its coverage of genres, which range from painting, sculpture, calligraphy, and crafts, to architecture, gardens, and photography to manga and anime; and of themes ranging from the religious to the profane, the sublime to the humorous. Tsuji’s unique perspective as an art and cultural historian is informed by his work on many aspects of Japanese art and cultural history in collaboration with archaeologists, anthropologists, and practicing artists. This enables him to link periods, themes, and media with a thoughtful and flowing narrative that places each piece and artistic style in context. With more than 390 full-colour images, along with references to many others, it illustrates the aesthetics of Japanese art and its qualities both particular and universal. History of Art in Japan offers a fresh perspective on the history, diversity, cultural roots, and aesthetics of Japanese art. It demonstrates its universal characteristics through specific works, providing in a single volume a comprehensive overview of the entire breadth of Japanese art. This work is essential reading for anyone who wishes to understand not just Japanese art, but its aesthetic, history, and cultural context. Tsuji Nobuo is a professor emeritus at the University of Tokyo and Tama Art University and a leading authority on the history of art in Japan. His publications include Kisō no keifu (Bijutsu Shuppansha, 1968; published in English as Lineage of Eccentrics: Matabei to Kuniyoshi; Kaikai Kiki, 2012), Kazari no Nihon bunka [Kazari in Japanese Culture](Kadokawa Shoten, 1998) and Playfulness in Japanese Art (Franklin D. Murphy Lectures VII, Spencer Museum of Art, University of Kansas, 1986), among numerous other works. Nicole Coolidge Rousmanierei is director of research at the Sainsbury Institute for the Study of Japanese Arts and Cultures and professor of Japanese art and culture at the University of East Anglia in Norwich, England. Her publications include Kazari: Decoration and Display in Japan, 15th-19th Centuries with Tsuji Nobuo (ed., British Museum Press, 2002), Crafting Beauty in Modern Japan (ed., British Museum Press, 2007) and Vessels of Influence (Bloomsbury, 2012). She is the lead curator of a major exhibition of Japanese manga to be held at the British Museum in 2019.